Interior Minister granted authority to enforce the Hours of Work and Rest Law amid anger over allowance of Sabbath desecration in Tel Aviv. 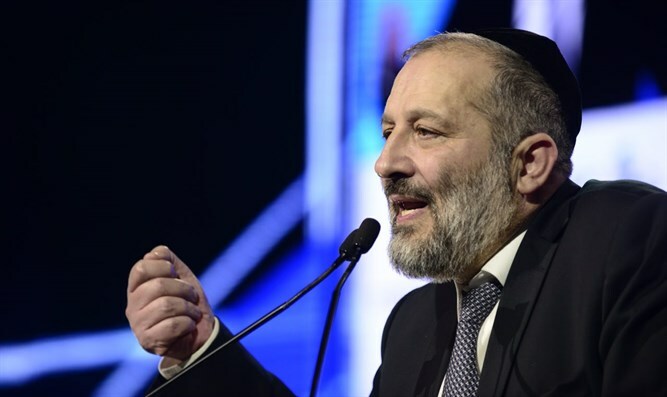 Interior Minister Aryeh Deri received the authority to enforce the Hours of Work and Rest Law during a meeting between Prime Minister Binyamin Netanyahu and representatives of the haredi political parties Thursday. The meeting took place amid outrage among the religious parties over the Supreme Court's decision to allow certain businesses in Tel Aviv to remain open on the Sabbath. It was also agreed during the meeting that the Prime Minister will inform Attorney General Mandelblit of the government's position that another hearing in the Supreme Court is needed and that he will demand a wide panel of the Supreme Court on the subject of the opening of supermarkets in Tel Aviv on the Sabbath. At the same time, the drafting of a bill will continue, which will preserve the authority of the Interior Minister in the approval of municipal bylaws. MK Roy Folkman (Kulanu) made it clear that his party is committed to the status quo on the issue of the Sabbath in the public sphere. "We have a coalition commitment and we are committed to the status quo," Folkman said in an interview with Kol Barama radio, adding that reports that Finance Minister Moshe Kahlon would oppose the bill to maintain the status quo are not true.